You know how the concept of “Florida Man” has caught on and flourished in the Internet ecosystem because every batshit, trashy story that goes viral inevitably comes from some meth-skinny dude with bad facial tattoos in Florida? “White American Man” is like that, except that instead of the Floridian sub-species, we highlight our nation’s racist douches. Just like Florida Man, White American Man is a very specific type—a tense, angry, financially secure, over-entitled, under-sexed and fully repressed Caucasian fellow of a certain age who absolutely cannot tolerate the fact that black and brown people are attempting to exist in his presence. And so, unable to contain his fury, he acts out publicly in ways that are degrading and embarrassing to himself and everyone around him. The archetype for the American White Man is Duke University’s Larry Moneta, who got two workers fired for playing a rap song by accident—read about that here. Then he called a woman fat, and stormed out. 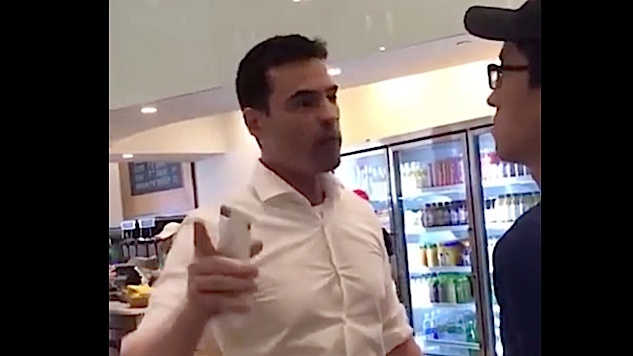 This guy has it all—the attitude, the near-hysterical rage, a full arsenal of stereotypes ready to deploy, and even the button-down white shirt. Great stuff, White American Man. UPDATE: He’s been ID’ed by the Internet. Even funnier, he’s a lawyer whose website says he’s fluent in Spanish! Please let Attorney Aaron M. Schlossberg of Midtown Manhattan know I’m trying to get in touch with him. I have a few questions.